During August our 'Artwork of the Month' display at Guernsey Museum will feature a video about the artist. The installation will be in place at Castle Cornet throughout the summer. Best known for his imposing and highly acclaimed Angel of the North Gormley over the last three decades has been working relentlessly examining and re-examining the figure. 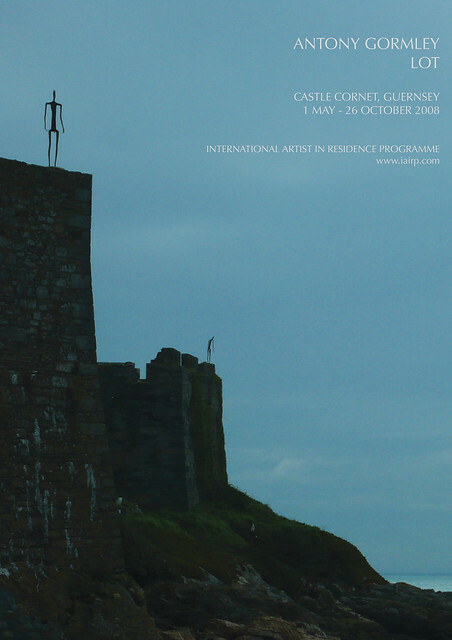 In LOT, an installation devised specifically for Castle Cornet, Antony Gormley brings together two aspects of his work. Strategically positioned on high-up vantage points, Gormley has sited five works from his Insider series in and around the grounds of the castle. These gaunt emaciated figures, which are silhouetted against the sky, appear to be like sentinels on guard while in the basement of the Carey Tower standing alone, in solitary confinement, is Diaphragm V. The two works counterbalance each other. The Insider series evoke the core energy of the body, while the hermetically sealed lead Diaphragm work contains a hollow space that was once occupied by the artist's body. Building on this temporary installation the International Artist in Residence Programme is organising in the castle, on the 23 and 24 September 2008 the first Art and Islands conference. This conference will look at the place of art in our society, while examining the effects such a major installation has had on the island and the possible impact an island could have in shaping the agenda of the art world in today's global economy. Artist, architects, academics and arts administors including Antony Gormley, will be speaking. For more information about the programme - visit www.iairp.com.